Here in Raloo we are very blessed with a dedicated team who are involved in Puppet Ministry. 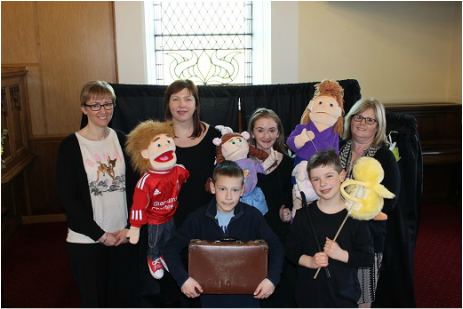 Gail, Glenda, Cara, Helen, with helpers Aaron and Adam bring to our Children's Address a light-hearted and easy form of bible teaching through the Puppets. The Puppets are called Sid, Lydia and Zoe and there is also another most recent Puppet called 'The Professor'. The children (and the adults) look forward to the message that the Puppets bring and Sid (in the football shirt, not sure what football team he supports!!) has been known on occasions to tell jokes and even sings very tunefully.